A decade ago it might have been socially acceptable to swim with dolphins in a hotel pool. But those days are gone. Now posting a holiday pic posing with Flipper is hugely controversial. Just ask reality TV star Kim Kardashian, who found herself in hot water after swimming with dolphins in Mexico. Or Real Housewives' Bethany Frankel, who copped a wave of social media criticism for visiting Atlantis Paradise Island's Dolphin Cay in August. Ever since the 2009 Oscar-winning documentary The Cove exposed the cruel dolphin hunts in Japan and the 2013 documentary Blackfish exposed the mistreatment of orcas to a mass audience, the dolphin captivity industry has been fighting a losing battle. SeaWorld's attendance rates plummeted in the wake of the second film, and the world's largest marine theme park company's profits fell 84%. Hotels are not immune to the flow on effect of this social change. Those that offer dolphin experiences are increasingly becoming the target of organised demonstrations and animal welfare campaigns. 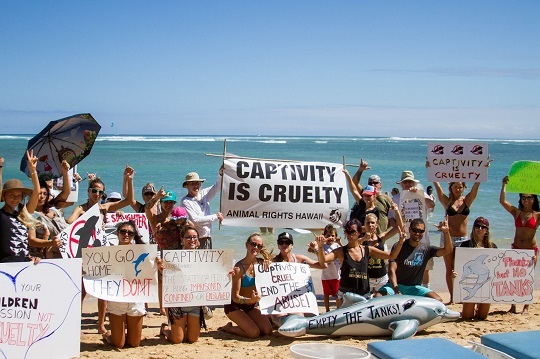 Dolphin Quest in Hawaii, for example, is the frontline of regular protests from local animal welfare groups, who line up in front of the hotel for hours with signs sporting slogans such as "Captivity is cruel" and "Thanks, but no tanks". It's easy to try and discredit activists and animal welfare groups by labelling them 'extremists' (a 'framing' tactic the dolphin entertainment industry has been using for years). But their concerns don't just come from a place of compassion. They are backed up with science and well-respected marine mammal experts. Studies show captive dolphins regularly exhibit some degree of abnormal or stereotypic behaviour. This can range from self-inflicting trauma by banging their heads on concrete walls to biting the sides of their pools, floating motionless for long periods (called 'logging'), or 'pacing' around and around in circles.